How configure color in InDesign for a specific printer? In my work recently was bought a Brother MFC-L8850CDW printer, CMYK tonels. But no matter what we do, when a document or a PDF made in InDesign is printed, the output colors on paper have a huge difference between what we see in the screen. For example, the cyan or sky-blue are printed like dark-blue, or the magenta that is printed almost like red. I know that the colors on the computer display never would be the same when printing, because the color space (RGB vs CMYK). But, with that huge difference? I think is something wrong with the color configuration in InDesign... (and by saying InDesign, I'm refering to Photoshop and Illustrator too). So, how can I configure InDesign for print right the colors? I mean, for represents right the colors on printing with the greatest similarity as possible as we see the colors on the computer display? You need to profile both. 2) You follow instructions on calibrating your monitor, the hardware analizes patches of color the inner software generates and adjust the output accordingly. 3) You print a sample of color patches provided with the hardware's software, scan them with the munky and it sends all the necesary corrections as a profile. The next time that you print that sample should be with the colors tweeked accordingly. 4) You use that profile in your Indesign and printer. There are some diferences between munki photo and munki design. Read at the specifications or ask with the provider. 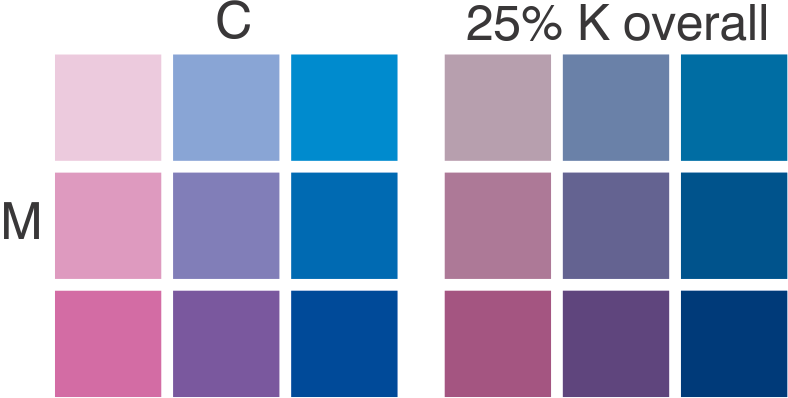 6) For color swatches, for example on Ilustrator. Prepare a series of sample patches like this: http://otake.com.mx/Foros/Koverall.png print them and choose the values as you need based on the printed sample. 7) On photos Compare a printed photo with how it looks on the monitor. Tweek the image on the screen to compensate the flaws you see on the print. If your print looks too dark, make it lighter on the screen. And prepare a Photoshop action accordingly to be used on a copy of the photos to be printed. 8) Save some money and after you purchase the calibration hardware go back to your original photos and discard points 5 to 7. Not the answer you're looking for? Browse other questions tagged adobe-indesign print-design color-spaces color-reproduction or ask your own question. Is there any free software for use with printed documents (for accurate CMYK)? Can you design print material with the intent to use LC and LM? Why does the color model still matter? Is there a way to create/modify colors in InDesign with an HSL or HSB picker?